The beauty of growing is that each morning is a new day of lessons. This morning I realize that if I stay in one place for too many days in a row, a longing sets in. Today, I’m longing for mountains. This is my 11th day of waking up in Haiti. And in the same room, no less. A personal best after a series of weeklong trips to Haiti. But a drop in the bucket compared to my near future. I’m here for the long haul this time. It is one thing to understand this intellectually. It’s a slow burn as it sets in. And it’s good, all good, but an adjustment every day. I’m fortunate to stay in a beautiful, comfortable and reasonably priced hotel. Trinity Lodge is on Delmas 75, a very nice neighborhood. And only three days into my stay here, I found the apartment where I want to live — in the same neighborhood! Amazing! But as things go in a place like Haiti, it’s sloooooow going. The real estate agent had to travel out of town and progress halted for a week. And I’ve spent that week here in the lodge, walking about the neighborhood, meeting new and wonderful people, getting to know other lodge-dwellers, visiting two different churches and — well, a lot of time to look out over the city from the lodge balcony. I hope we will make progress on the rental this afternoon, and this morning I’m reflecting of what I’ve learned so far in the city of Port-au-Prince. All five of your senses are overwhelmed here. The sounds of barking dogs, crowing roosters, crying children, little boys calling for their Poppi — over and over again calling for Poppi! Poppi! Poppi! The sights of work. Not far from here one morning, I watched at least 20 workers spent one day pouring concrete on the roof of a long building. While the spinning concrete truck poured it out, workers filled gallon buckets and handed them, one at a time, to more workers up a tall ladder. On the roof, more workers carried a bucket from the roof’s edge over to where it was needed, and empty buckets were brought back to the edge and lowered by sliding down a rope. Then the process started all over again. The sight of school children rushing back and forth to school in bright navy blue uniforms, then changing quickly into their other clothes to play in the streets. It’s often soccer if they have a ball, or a kickball game but with a rock. The constant feel of rolling sweat in the high heat and humidity or a treasured breeze. The smell of burning garbage or the stinging odor of black smoke rolling from a vehicle’s exhaust is tempered by the light scent of perfumed blossoms and meals prepared either in kitchens or along the road by merchants selling “fast food” like roasted corn on the cob. And the layered taste of slow cooked foods — roasted chicken, goat stew, rice and beans — and sliced melon, mango, banana or, my favorite, fresh avocado. How ironic that in a nation of so many hungry people those with resources eat so well. Each bite reminds me of the reason so many of us are here, and why so many of you support us in our work. Yes, the city life has its perks, but my longing? It’s for mountains. I’m drawn to them like to water. In the Shenandoah Valley and in Haiti. And once I get the apartment deal settled, that’s where I’ll head here. I’m going to spend about a month in Cherident, the place where I’ve often visited with Tinkling Spring Church. I will live with a family and work hard on my Creole. Prayers are welcomed for this project, by the way! 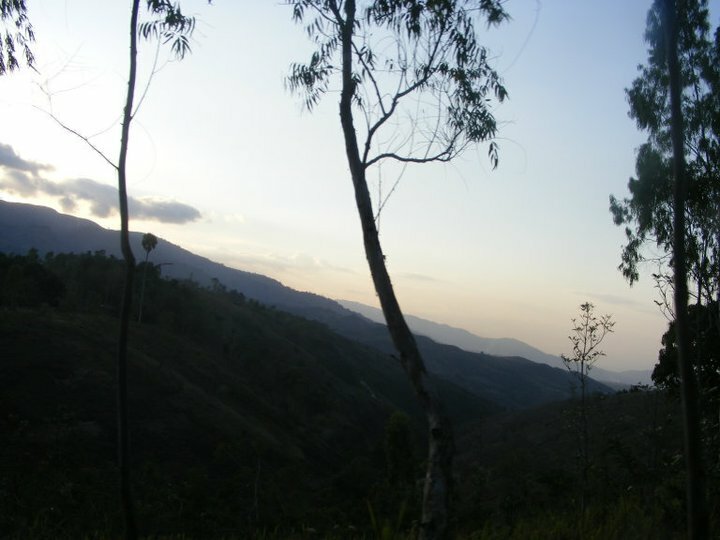 A scene from a road in southern Haiti. And even when I return to the city, this will be my base. I hope that my work with FONDAMA, an association of agricultural groups, will find me often in the countryside, enjoying the mountains and valleys of this beautiful country. For now, though, I dream of mountains, both here and far away in my native land. It’s disconcerting, being a salaried mission co-worker living in Port-au-Prince. I awaken each day to the sound of the air conditioning turning off. I’m well rested and safe. Young women scurry quietly around the lodge making breakfast, wiping down floors and railings. Outside the lodge balcony, I hear the sounds of a rooster here or there, a child cries, workers chant as they walk up and down the mostly paved roads looking for employment opportunities. Breakfast is delicious. Sometimes it is scrambled eggs with onion and pepper and yummy local spices, lightly toasted bread with grapefruit preserves and freshly sliced mango and melon. Other times it’s perfectly fried pancakes or French toast. The coffee always is hot and ready to drink. You also have a choice of a cool juice and, of course, iced water, Culligan water, the bottled kind that weak-stomached foreigners can consume without digestive worries. Because I do not have regular transportation, sometimes someone has arranged to pick me up to take me shopping, out on errands or to church. One friend who lives here picked me up and took me out to a coffee shop! Think of Starbucks without the Starbucks brand. Wireless, cute little tables, pastries and a variety of hot and cold drinks. A wide balcony at the front of the lodge looks out over the upper middle class neighborhood, but the workers who travel through on foot or in beat-up vehicles aren’t so fortunate. There’s an air of frustration among them: the fruit sellers, the bored un- or under-employed. It’s not so safe in the streets, even here. But it is on my walks and rides around the city that I feel the disconnect. Though there is construction ongoing — Delmas 75 where I am staying and where I will live — is being improved, which means travel by car is often delayed and the flagman we’re accustomed to in the States isn’t working. If you see someone there to direct you, it’s often a passerby or even the guy on the front-end loader moving equipment. It’s catch-as-catch-can around these parts. But get too far off the main roads and travel is rocky and dusty. Narrow roads connect neighborhoods. Hills are everywhere, steep and difficult to traverse, even in well built, four-wheel-drive trucks. Passengers bounce around while the driver holds on tight to the steering wheels. Many, many swift and silent prayers are said. And when I’m not girding myself from being tossed like a ragdoll and can look out the windows, I see that other part of Port-au-Prince, the part you see on the nightly news. The tent camps that arose after the Jan. 12, 2010 earthquake are being reduced, but the residents haven’t moved up far. Many thousands now inhabit other camps in ragged homes, poorly built “stick” homes covered with rusted corrugated tin and old tarps. The houses wear the tired look of overuse, and so do the people. Dust is everywhere, but yet palm trees blow in the breeze. Point your gaze to the sky and you might be fooled into thinking you’re at the Caribbean resort we Americans are so much more familiar with. It’s funny, the things I think of when I travel to different parts of this city. In 2002, I traveled to Antigua. As we often do, my friend Kay and I got out of the resort to see the countryside. 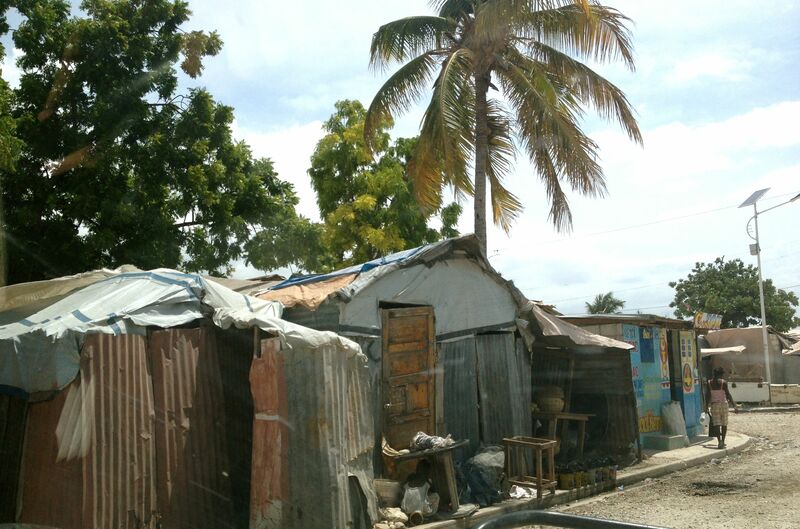 We saw where most Antiguans live, peering at their small, cement homes located too close to the city streets. And inside, I could see the bright colors of the decorations. I determined then that I would have a Caribbean home — decorating with primary colors and beautiful, bright art. That never happened in the States, but now is my time. In these camps I drove through on Sunday afternoon, there is a feeling of permanence, as if the residents are settled into this reality. Some of the canopies over the “homes” have been scalloped into a pretty design. Other designs have been cut through the tarps to serve as a window. There is a measure of style even in the deepest poverty. This is where many of the people displaced in the 2010 earthquake still live. Such poverty won’t be my reality, but it will never be far from me. The danger will be in how I attune my heart to what I can do to alleviate suffering, and what I will not be able to do. This will be a great challenge for me while I am here. All traffic stopped on Delmas 75 so workers could load a pile of garbage on a trash truck. This is progress! OK, so here goes. 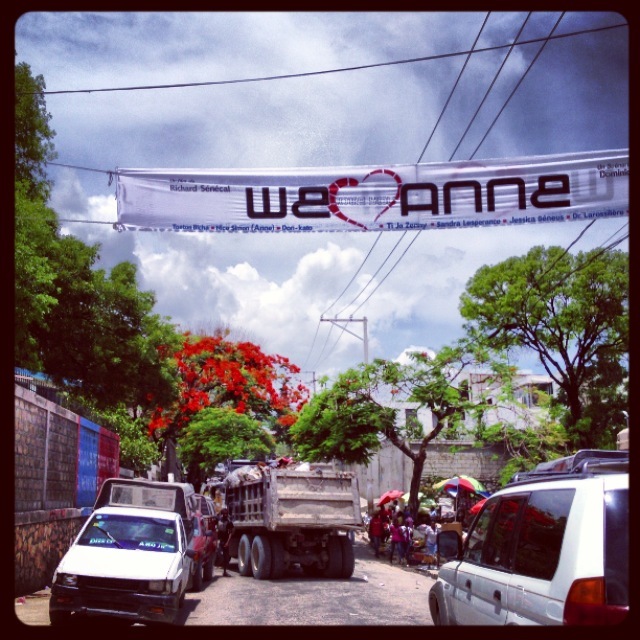 I’ve been in Port-au-Prince for a week now. I’ve been busy enough — finding my way around, going out with a real estate agent to look at homes (that’s a story in itself! ), finding the almost perfect place concentrating on the old saw: location, location, location!, and being ferried around town by wonderful friends new and not-so new. Has it really been just a week since I got here? So in my downtime, I’ve buzzed away at a couple of essays — working hard to encapsulate what I’ve seen and heard and felt — but that’s obviously not working. My other documents are sitting here on the desktop of the laptop, and they are not telling the story. So here I go …. I arrived here on May 25, traveling from Virginia to begin a three-year term working with Haitian agricultural groups. 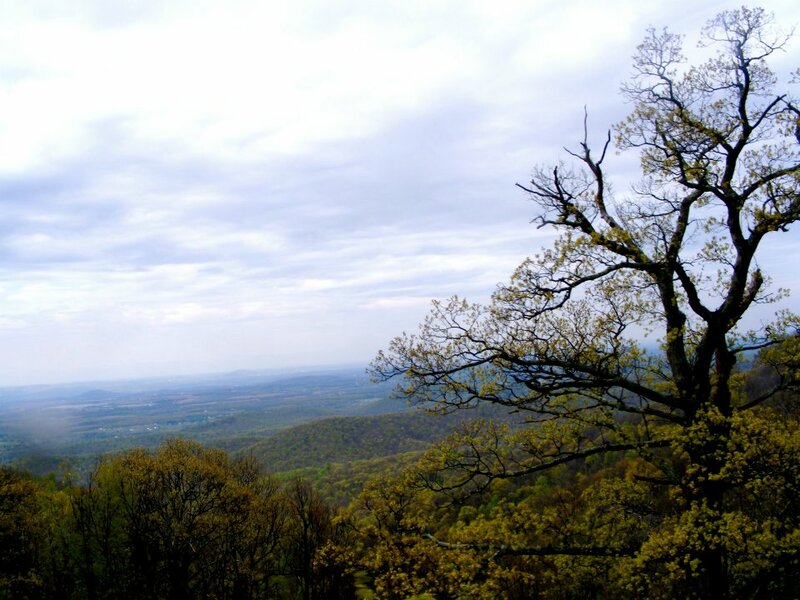 My first task is to find a home, and once I do, I will travel to Grand Colline in the southern mountains to live with a family and work on my Creole. The house hunt is coming along, but everything works slowly here. More later on this. It’s Sunday afternoon, the first Sunday in June. I’m sitting in the back courtyard of Trinity Lodge, a wonderful hotel/guesthouse in Delmas, a long winding neighborhood that roves from downtown PAP up to the ritzy Petionville. It’s been an experience being here and meeting the fellow guests. A group of young adults from a church group in Florida came in last Saturday, too, the same day as I did. They took me in like a stray puppy, inviting me to dine with them, pray with them and even took me to church last Sunday. They also — one by one — shared with me their own stories. They offered prayers for my beginning ministry. It all seemed lonely when they left on Saturday morning, but by then I was getting to know Margo, a Dutch water management expert. I’ve learned much from all of them. On Monday morning, I got brave. Literally got brave. I decided to venture out on my own, carefully carrying well concealed money, my expensive cell phone and a look of quasi bravado on my face. I’m not sure that look was working. I rather think the locals wondered why this foreigner who looked as if she feared she’d be robbed was walking past their fruit stands with barely a hello. Fortunately I realized the error of my ways about the same time I realized I’d gone completely the wrong way. I relaxed a bit, asked for directions back and covered in sweat, made it back to the lodge. I rested, and then, doggone it, I started out again. I’d figured out the right way this time and began to take note of the people and places along the way. On this journey, just beyond the corner where the tap-taps (repurposed pickups and other vehicles used for cheap transportation) linger waiting to be loaded, all traffic was stopped. A trash truck — a real trash truck — was loading a pile of garbage with a front-end loader. Workers used shovels to put the remaining trash into the truck. Maybe not everyone gets excited by a trash truck, but it sure looked like progress to me. After the big diesel truck lumbered off in a cloud of smoke, I carefully traversed around the shiny mess left behind. I reached the main street — Delmas — with an inward cheer and managed to make it to Epi D’Ors, a quality bakery that doubles as a sort of fast food joint. I was nearly put off by the idea of crossing the busy street as a pedestrian, when a small guardian angel showed up at my side. He was about 10, and he quickly jumped in to let the motorists know I needed to cross to the other side. I was quite appreciative of his efforts and skill, but wondered whether to offer him a few dollars. “Don’t give the kids money,” I hear regularly. “That’s not helpful.” So I didn’t, but in retrospect, I regret that. He wasn’t begging. He was helping. And to his greater credit, he didn’t ask for money. Learning. Learning, I am. I walked into the chilly, air-conditioned restaurant and paused to get my bearings. I greeted the numerous armed guards, but with caution. That’s still an adjustment for me. I managed to get gourdes out of the ATM, order my meal, sit and eat without passing out from the heat and sudden emergence into air conditioning. Aha! Perhaps I CAN do this, after all! After purchasing some Skinny Cow cheese, crackers and a Gatorade (seemed smart after my traffic-dodging workout), I headed home, quite, quite proud of myself! Every journey I’ve taken through Haiti has primarily been in an air conditioned vehicle. I arrive at the airport, toss my bags into a jeep of some brand and head out to the countryside. When I ride anywhere in the countryside, dozens of Haitians will jump into the back of the truck for a ride. Anywhere. Children as young as 5 and women who are maybe 60 or older, and every age in between. It’s always made me realize that the opportunity to ride is a treat, and comfortable seats in air conditioning is almost like royalty. But it wasn’t until my long (for me), hot and sweaty walk that I understood that walking is the reality of maybe 70 percent of Haitian people. In the city, in the countryside and everywhere in between. Walking. Dodging vehicles. Keeping an eye out for pesky rocks and large holes in the sidewalks, vast dips where asphalt has crumbled. Holding onto to small children. It was a good experience for me to understand by literally walking in the footsteps of the people I’ve come to be with. I’ve taken that walk again and will again in the future. But mostly that Monday when I arrived back at Trinity Lodge with a weary smile and a look of achievement, I understood a great lesson of the world: Most other people have it so much harder. It really puts complaining in perspective. In my next post, the great house hunt! And my plans for this next week!